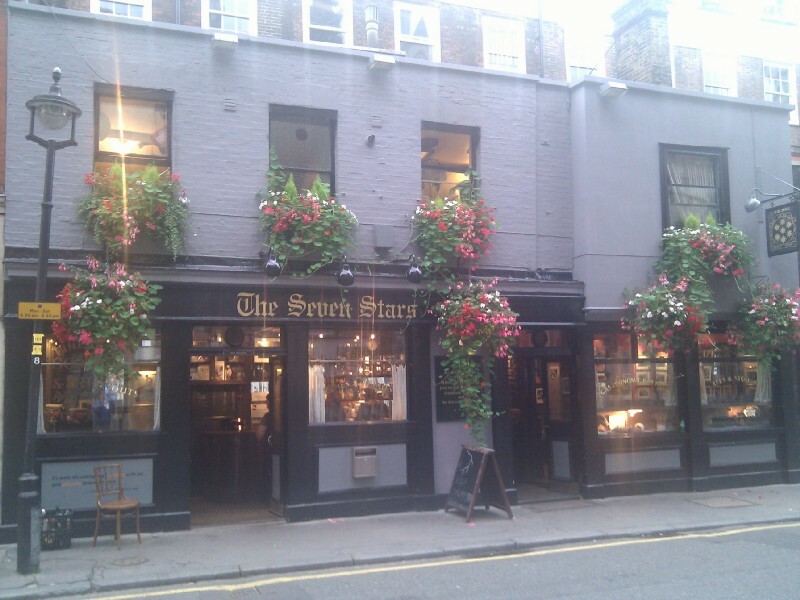 This page attempts to collate as many historical records as possible about the Seven Stars, to verify it's continued usage as a pub throughout it's 400 year history. Should it be proved that the building that stands today does indeed date back to 1602 then it will represent an amazing record of survival. Had the Seven Stars been located just a few hundred yards to the East, it would have been engulfed in the Great Fire of London in 1666. Had it been a few hundred yards to the West, it would have likely been demolished in the early 20th Century to make way for the building of Kingsway and Aldwych, a development which claimed many old buildings in the area. Had it simply been on the South, rather than the North side of Carey Street, it would have been demolished in order to build the Royal Courts of Justice. Carey Street is in the parish of St. Clement Danes. The church of St. Clement Danes reputedly takes the "Danes" in its name from Danish (effetctively Viking) settlers that had lived in this area as early as the 9th Century, and St. Clement is the patron saint of mariners. Lincoln's Inn, one of the four Inns of Court, lies immediately to the North of Carey Street, and has occupied the site since at least the 15th Century (records go back as far as 1422). Despite large changes to the surrounding area over the past few hundred years (the Great Fire in 1666, the building of the Royal Courts of Justice in the latter half of the 19th Century, and the early 20th Century clearances to make way for Aldwych and Kingsway), Lincoln's Inn has remained in the same place, and the Old Hall, dating to 1489, is one of the oldest buildings in the area. The importance and continuity of Lincoln's Inn is probably a significant contributor to the survival of the Seven Stars throughout the last four centuries. As an aside, the location of the Inns of Court today, just outside the old walls of the city of London, stems from a decree made by Henry III in 1234 that legal institutes could not reside within the city walls. The area which Carey Street now occupies does not appear to have been significantly developed at the time of this 1520 map of London - there is a small lane opening out onto Lincoln's Inn Fields (or Ficket's Fields) but it does not seem to have been significantly built upon. The brick wall around Lincoln's Inn was erected in 1562. It's possible this may have coincided with development of the surrounding area, which the map above shows was largely open fields to the West of Lincoln's Inn in the early half of the 16th Century, but presumably by the late 16th of early 17th Century had been built upon. Purportedly built in 1602, the year before Elizabeth I died. The name is believed to have derived from the "The League of Seven Stars" - referring to the seven provinces of the Netherlands, and was thought to have at one time been called "The Leg and Seven Stars", a corruption thereof. The Dutch connection is reputed to stem from a time when this area was used as a port (the nearby, and now covered, River Fleet was once navigable), and Dutch sailors were said to have settled close by. Another possible derivation for the pub name "Seven Stars" is from the seven stars that make up the plough constellation, but this tended to be more typical in rural areas. 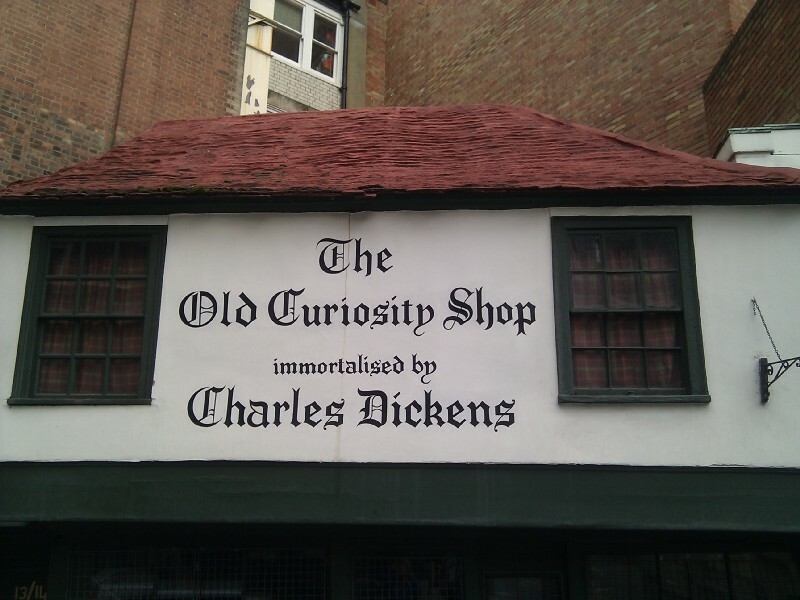 Other nearby buildings date back to before the fire, for example the Old Curisoity Shop on Portsmouth Street - purportedly the oldest shop in London. It is said to still be the original building dating from 1567 (although the name actually came after Dickens' book). Carey Street may have been named after Sir George Carey (1547 - 1603), whose father was Elizabeth I's cousin. As such it's possible the street was built, or at least named, around the same time that the Seven Stars is believed to have been established. That said, two maps of London from the latter half of the 1600s (The 1658 Faithorne map of London and Hollar's 1675 map of London) seem to suggest Carey Street may not have been laid out until later - here's the relevant section from the 1675 map - the route of Carey Street would be roughly along the Southern edge of Lesser (Lower?) Lincoln's Inn Fields here. So this could imply that Carey Street (and therefore the Seven Stars) was in fact built around the same time New Square was. It is tempting to believe that the 1602 date on the sign has in fact been misread at some point in history, and was actually 1682. "Carey Street has its reminiscences. The heroic Lady Fanshawe tells us, in her "Memoirs," that in 1655–6 she and her family spent a twelvemonth in it, as tenants of a house belonging to Sir George Carey, from whom apparently the street was named." "We returned to our lodgings in Chancery Lane, where my husband was forced to attend till Christmas 1655; and then we went down to Jenkins, to Sir Thomas Fanshawe's; but upon New Year's Day my husband fell very sick, and the scorbutic again prevailed, so much that it drew his upper lip awry, upon which we that day came to London, into Chancery Lane, but not to my cousin Young's, but to a house we took of Sir George Carey, for a year." This doesn't in fact seem to refer to it as Carey Street explicitly, and the dates are confusing given that Sir George Carey died in 1603 (succeeded in the title of Baron Hunsden by John Carey who died in 1617 then in turn by Henry Carey who died in 1666). According to this page an alternative for the naming of Carey Street is Nicholas Carey (1651 - 1697), who also lived in the area. Alternatively, it seems the Carey name is sometimes spelled Carew - could the references to Sir George Carey instead be Sir George Carew the diplomat (died 1613)? This George Carey seems to have been affiliated with the Court of Chancery, so it seems a more likely candidate to have had Carey Street named after him. Adjoining Serle street was named after Henry Serle, another local landowner, who developed part of New Square. The next paragraph then reads "These signs of London taverns are fully discussed in the Spectator of April 28, 1710, quoted in Chapter V, p. 78." the Fox and the Seven Stars to do together?" See appendix at the bottom of this page for more references to the poem published in the Apollo and the commentary in the Spectator. Carey Street (at that time written Cary Street) appears in this 1720 map of the parishes of London. Despite significant transformations to almost all of the surrounding streets between 1720 and the present day (particularly the building of the Royal Courts of Justice, and the clearances required for the construction of Aldwych and Kingsway), the position and route of Carey Street looks largely unchanged. However it's not clear that this refers to the Seven Stars. Given that the Seven Stars is right on the edge of the St. Clement Danes parish boundary, it may be possible that in an earlier period the boundaries may have been slightly different, and perhaps it was actually part of the neighbouring parish (St. Andrews?). For 1718 there are three entries for Carey Street, the names and the rest of the text are again very hard to read. Carey Street appears on this 1790s map of London. Individual buildings are numbered, so you can actually see number 53 - the Seven Stars - albeit not labelled explicitly as such. This also shows the nearby parish boundary between St. Clement Danes and the Liberty of the Rolls. A stone parish boundary marker still exists on the North side of Carey Street today. Plenty of records of the Seven Stars during this period, from a mixture of directories and census returns. Formerly known as: The Log and Seven Stars Public House CAREY STREET. Public house. Perhaps C17 in origins (dated 1602) with later alterations and additions. Painted brick clads partial timber frame; slate roof. 2 storeys and attic; 4 windows, that to right broader and set in projecting jetty which may have been a separate building. Ground floor with C19 wooden public house frontage of 4 windows and 2 entrances flanked by pilasters; panelled aprons to windows. Gauged brick flat arches to 1st floor recessed sashes, except 1 window in jettied bay to right with reeded, architraved surround. INTERIOR: two rooms to ground floor. C19 bar backs with mirrors, that to larger bars with cupboards. Bar counters to both rooms of similar date. c1900 corner fireplace in right-hand bar, its joinery continues as ledges round side walls and across windows. Ceilings with thin beams of similar date masking earlier framing. Narrow stair to upper floors set behind main bar. Thomas More chambers next door at 51-52 Carey Street is also a listed building. It was built in 1838. 7th January 1878 Lease assigned by Joshua Henry Wright to Francis Brian? 24th January 1878 re-leased by the estate of Charles Allen King to Francis Brian. 14th June 1882 Mortgage by Francis Charles Marr to C. A. Hanbury for securing £50. 4th June 1889 Charles Addington Hanbury to Hodgson's Kingston Brewery Company Limited, transfer of mortgage. 15th March 1899, from Sir Allen H. Young to Mrs. C. A. Smith, release of equitable charge. Truman, Hanbury, Buxton and Company were in the Brick Lane brewery, now known as the Old Truman Brewery. Hodgson's Kingston Brewery Company was eventually bought by Courage in 1943. In a 1975 photo of the Seven Stars the pub has Courage signs. This could suggest the pub was a tied house from 1879 for the next hundred years or so (today it is a free house), although the "release of mortage" slightly confuses this. Sir Allen Young (1827-1915) was a famous mariner and explorer. The C. A. Hanbury mentioned is almost certainly Charles Addington Hanbury (24th June 1828 - 13th December 1900), one of the partners in Truman, Hanbury, Buxton and Co.. In the 1840s the bankruptcy courts moved to Carey Street. "The Seven Stars we fear has been denuded by some vulgar person of its leg or league." They also include the "I'm amazed at the signs" poem above. Another inn in the street was the "Seven Stars," formerly the "Leg and Seven Stars," a corruption of the "League and Seven Stars," denoting the Seven United Provinces. Much of the nearby area was changed at the start of the 20th century with improvements to the Strand, and the creation of the Aldwych crescent and Kingsway. Carey Street however seems to have been largely unaffected by this, nestled as it is between two important institutions - the Royal Courts of Justice and Lincoln's Inn. See http://www.arthurlloyd.co.uk/Aldwych1902.htm for more details on the creation of Aldwych. "Our streets are filled with blue boars, black swans, and red lions; not to mention flying pigs, and hogs in armour, with many other creatures more extraordinary than any in the deserts of Africa, My first task therefore should be like that of Hercules, to clear the city from monsters. In the second place I would forbid that creatures of jarring and incongruous natures should be joined together in the same sign; such as the bell and the neat's tongue; the dog and the gridiron. The fox and goose may be supposed to have met, but what have the fox and the seven stars to do together ? ... "
...and there are several Eagle and Child pubs. Could be this one? ...citing it as from the British Apollo of 1716 (quoted by Sir Ambrose Heal in Signboards of Old London Shops).